Equity Release Schemes in the European Union - iff - institut für finanzdienstleistungen e.V. Equity Release Schemes (ERS) transform fixed assets in owner occupied dwellings into liquid assets for private pensions. They thus enable a homeowner to access the wealth accumulated in the form of his or her home, while being able to continue to live in it. An illiquid asset becomes a source of liquidity, mainly for consumption purposes. There is a Sale Model ERS and a Loan Model ERS. 13 Member States had some form of ERS. The UK, Ireland and Spain have developed a significant ERS market. The sustained rise in house prices in many EU countries over the past decade, currently readjusting sharply downwards, has without doubt played a major role in encouraging innovative lenders to take the risk of granting ERS to a steadily growing group of customers who have benefited from an increase in their asset wealth, without a corresponding improvement in their income position. The main risk for providers is non-recovery of their capital outlay and failure to earn any interest on it (credit failure risks). Press coverage has characterised this risk as, for example, “the lifestyle dream that can turn into a nightmare.” The system requires intensive advice. 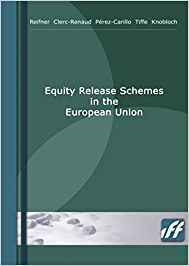 This book based on a report to to the EU Commision gives sophisticated information on existing models, attitudes of consumers and suppliers, cultural barriers and the legal environment of ERS in all 27 EU-member states for an open discussion.